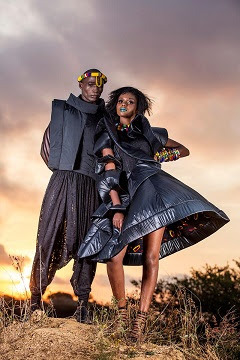 artSMart: AFROFUTURISM AT THE DURBAN FASHION FAIR 2018! For four days from September 19 to 22, the Durban ICC and surrounds will be transformed into a fashion extravaganza for the seventh annual Durban Fashion Fair with its 2018 theme - AfroFuturism - which forms part of the main Durban Business Fair. There’ll be a peek into the nitty gritty ‘business of fashion’ with an interactive panel discussion in the ICC’s Hall 1 on September 21 between 09h30 and 12 noon. This will feature leading industry players within the fashion related industry - Sasha Wyatt-Minter (Editor: www.all4women.co.za); Dimeji Alara (Fashion Director: ELLE South Africa); Masana Chikeka (Program Manager: Design at the National Department of Arts and Culture); Nthato Mashishi (Celebrity make-up artist) and Mandy Swart a TFG Buying Manager for Markham. The panel discussion topic will focus on Building a brand in the Fashion Industry followed by a Q&A session - which will be facilitated by TV & Radio personality, Anele Mdoda. Admission is free for the panel discussion! Anele Mdoda will also be hosting the 2018 DFF Recognition Awards on September 22. Tickets R100 (R50 students) per show (Sept 19/20/21) and for the Recognition Awards (Sept 22), tickets R200 (R100 students). Tickets can be purchased at webtickets.co.za or at Pick n Pay outlets. Follow all the fashion action at DFF facebook page: Durban Fashion Fair or on Twitter / Instagram @Dbnfashion_fair or #DFF 2018.